These are really good cookies. At Christmastime it’s fun to add cut-up gumdrops to them. From the Lion House Christmas Cookbook. Cream shortening and sugars till fluffy. Add eggs and continue beating. Add vanilla. Sift flour, baking soda, salt, cinnamon, cloves, and ginger together and add gradually to creamed mixture. stir in oatmeal and nuts. Measure 1/4 cup dough for each cookie and place on greased cookie sheet, about 4 inches apart. Bake at 350 degrees F. for 12 to 15 minutes, until light brown. Carefully remove from cookie sheet. Cool. Store in covered container. Makes 28 cookies. 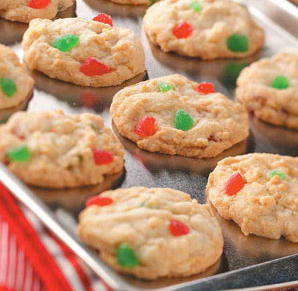 Variations: Add raisins, chocolate chips, cut up gumdrops, or M&M candies to dough and bake as directed. I got this recipe from my friend Kari. 3. In a large bowl, whisk together the flour, sugar, and baking soda. Add half of the melted butter mixture and whisk until completely blended. The mixture will be thick. Add the remaining butter mixture and whisk until combined. Add the eggs, one at a time, whisking until completely blended. Whisk in the sour cream, peppermint extract, and the vanilla extract. Whisk until smooth. 4. Scrape the batter into the prepared pan and bake until a toothpick inserted into the center of the cake comes out clean, 40 to 45 minutes. Let the cake cool in the pan for 15 minutes and then invert onto a wire cooling rack. Let cool completely before glazing. 5. While the cake is cooling, make the chocolate glaze. Place the chopped chocolate and corn syrup in a medium bowl and set aside. Combine the heavy cream and sugar in a small saucepan and put over medium heat. Stir until the cream is hot and the sugar is dissolved. Pour the hot cream over the chocolate and whisk until smooth. 6. Drizzle the glaze over the cake, allowing it to drip down the sides. Sprinkle with crushed candy canes or peppermint candies. Cut into pieces and serve. Note-if you don’t have sour cream, you can use plain Greek yogurt instead. The cake will keep on the counter for 2-3 days. Be careful when covering it because the glaze will stick to plastic wrap. I like to cover it with a cake topper.